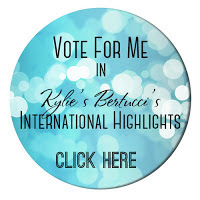 This card is included in Kylie Bertucci's International Highlights. The top ten winners will be part of an international blog hop - so we're all keen to do well! Please visit to see all the amazing cards and vote for your favourites. Our theme for this highlight is Masculine. One of our friends is celebrating his 70th birthday this week and this will be his card. I think the colour combination saves this card from femininity. I was concerned about adding the medallion and tassel but then I came to the conclusion that there's no reason why a man shouldn't have the pleasure of receiving a beautifully appointed card! Opulent but masculine with the Eastern Beauty bundle! 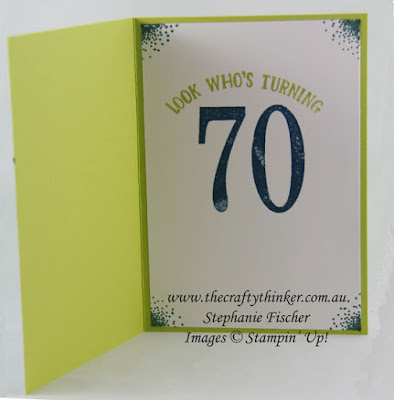 The card base is in the new In-Colour, Lemon Lime Twist (the one I thought I wouldn't like!) and the paper is from the Eastern Palace Specialty Designer Series Paper pack. The horizontal band is made with more Lemon Line Twist cardstock and some Dapper Denim decorated with gold stickers from the matching Eastern Gold Vinyl Stickers. The Dapper Denim, Gold Foil and Lemon Lime Twist medallion is created with the Eastern Medallions thinlits, Layering Circles framelits and a circle punch. At the centre is one of the gorgeous new Glitter Enamel Dots and of course there's a beautiful gold tassel from the new Mini Tassels Assortment. 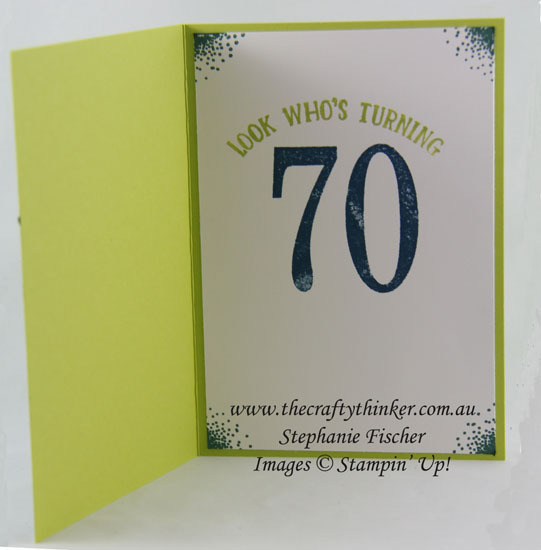 Inside the card can be found a greeting and age stamped in Lemon Lime Twist and Dapper Denim with the Number of Years stamp set. 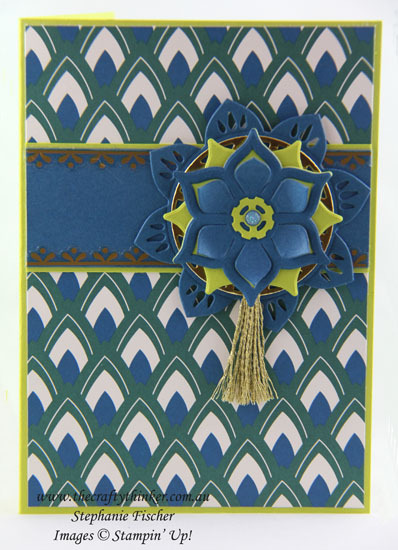 The corners are decorated with one of the stamps from the new Eastern Beauty stamp set and Tranquil Tide ink (one of the new In-Colours). Do click on the link to see all the wonderful cards and vote for your favourites.